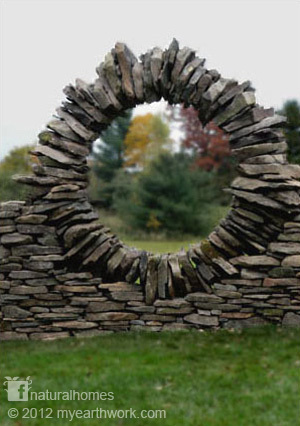 Stone, Gravity, Symmetry, Fibonacci and Thea Alvin. When someone connects with natural materials and the laws of nature, and brings to them experience and creativity the result, in Thea's case, is a collection of flowing sculptures. 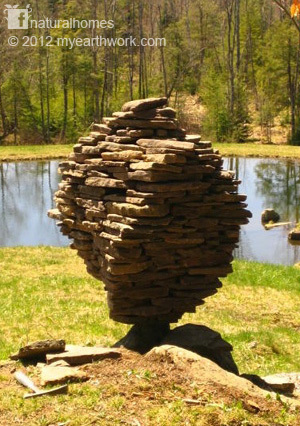 This is the extraordinary work of Thea Alvin an artist, sculptor and dry stone mason based in Morrisville, Vermont, USA. 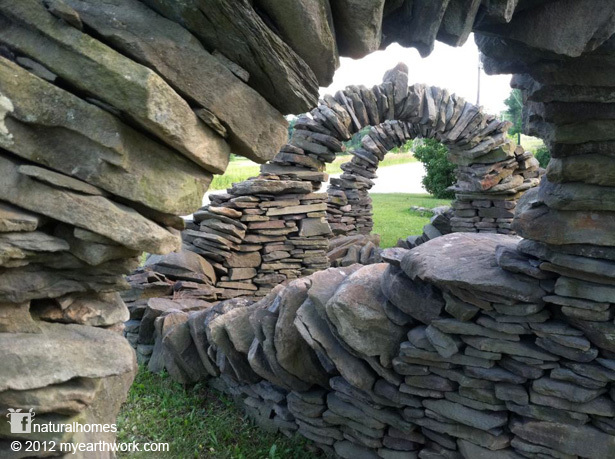 This winding wall of arches (right) stands at her Vermont studio locked together with gravity, inspired by nature and Thea's love of mathematics. Much in the same way these stones rely on each other for support, Thea shares her home with others. Together they tend the orchard, vineyard, gardens, goats and flocks of geese and chickens living a creative and supportive life together. Fibonacci mathematics drives Thea's designs and sets the rules for the Roman Arches that she often builds. The Roman Arch is a semicircle where all angles between the stones point to the centre of the circle. If this simple rule is obeyed the arch will stand. Here's a video from Thea with students learning to build arches with varying degrees of success, but as Thea says, "What did you learn about symetry? It's important." Refining her skills all the time Thea can't resist transforming stones into sculptures. Her energy and enthusiasm for her profession has made her a key figure in Yestermorrow's training program both in the USA and Italy where she teaches. 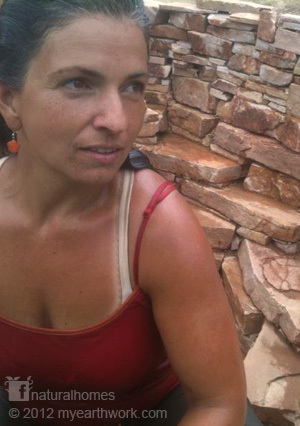 Here's Thea introducing the different components she brings together to create stone sculptures. 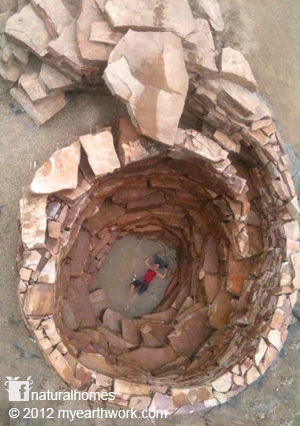 Left is a spiral cistern designed and built by Thea. The work consumed an extraordinary 500 tons of stone brought together as dry stones with balance, symmetry, experience and gravity. You can see more of the work on Thea's facebook page in the album 'Maxwell Cistern Gardens'. The series appears in nature from the patterns of seeds in the sunflower to the growth of the snail's shell and the distribution of leaves growing on the stem of a plant. It may also be instinctive in humans in finding the proportions of the Golden Ratio pleasing to the eye. You can listen to a discussion of the Fibonacci Series in this BBC Radio 4 program where at 14 min 50 sec they discuss the human instinct. When Thea (left) isn't teaching she builds impressive stone buildings like this chapel (right) with a triple gothic arch on the doorway and a starburst window. Join Thea on a 15 day course in Italy to learn about the preservation, restoration, and adaptive re-use of historic vernacular masonry buildings in the Piedmont region VIDEO. You will analyze and document existing structures and devise strategies and designs for the re-use of selected buildings while maintaining their historic features. Studio design time will be supplemented with hands-on construction on projects within the village. Field trips off-site, guided by an architectural historian, will be scheduled to supplement the main work of the course. This course, taught in English. More details on Yestermorrow.